Microphone/Privacy Bug Almost Fixed... Get Beta Now! 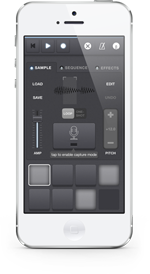 Triggler lets you rapidly record and sequence sounds from your device’s microphone or line input. Sample your voice, instrument or another sound source. Samples can be triggered and sequenced to create an arrangement. You can also add effects to modulate your sounds. This app is great for live performance and is set to inspire your sonic creativity!